Veterans, students and community members will gather tonight to celebrate the annual Veteran’s Banquet in the Hanover Inn. The event, which will recognize influential veterans in the Dartmouth community, is part of the College’s Veteran’s Day programming this week. At the banquet — which will be open and free to all students — Winnie Huang ’92, the president of the Dartmouth Uniformed Service Alumni, will present the James Wright Award to James Geiling, a professor at the Geisel School of Medicine. The award is presented to a Dartmouth community member who has exemplified “our ideals of service, college and country,” Huang said. Geiling is a retired United States Army Colonel and was a coordinator of first responders at the Pentagon on 9/11. Dan Hampton, a post-graduate master of arts in liberal studies student who attended the Navy Top Gun School and USAF Fighter Weapons School, will deliver the banquet’s keynote speech. Hampton, a bestselling author whose work has been published in six different languages, is currently the CEO of MVI International, a private company specializing in counterterrorism and high value asset protection. Toward the conclusion of the banquet, DUSA will also support a silent auction for its “Toys for Tots” program, which coordinates toy donation efforts from veterans to children in the Upper Valley area. Hampton will attend an upcoming coffeehouse in which he will discuss his perspectives and experiences with students. Rockefeller Center program officer Joanne Needham, who planned the event, explained that it might be particularly interesting for students to learn about what Hampton has accomplished since leaving the military. Today, veterans will also gather on the Green for a Veterans Day Retreat and Drill Ceremony, led by the Dartmouth ROTC. At the ceremony, the Baker Bell Tower will play Service Hymns, and a cannon will be fired to celebrate veterans’ contributions and sacrifices. Several other events related to veterans have occurred throughout this week, and more are scheduled for the weekend, Veterans Recognition Committee chair Sara Campbell said. Yesterday evening, veterans took to the ice at Thompson Arena as part of the third annual TuckVets v. IceVets Sled Hockey game. Louisa Howard, a board director and treasurer at Ice Vets Adaptive Sports, said the Tuck School of Business sponsored the game to raise money for programs that support veterans. The IceVets hockey team, comprised completely of veterans, provides veterans with a sense of camaraderie, Howard said. She added that the success of this program has allowed adaptive sports to work closely with the Veterans Association Hospital in White River Junction, Vermont. This game was part of a larger ice hockey season specifically for veterans, which began this September and will run through April. Yesterday, Tuck student combat veterans also visited Hanover High School to discuss their experiences in question and answer sessions. This weekend, veterans will have free access to all Dartmouth athletic events. Programming will culminate this Sunday with a 241st Marine Corps Birthday Ball. According to Campbell, the amount of programming scheduled for this year is consistent with the amount of programming scheduled for previous years. “Dartmouth has a long history of military service,” Huang said. She added that the College has recently increased its outreach efforts to veterans by becoming a University Partner of the Posse Foundation. “Dartmouth’s partnership with the Posse Foundation guarantees that 10 outstanding veterans will be admitted as first-year students to Dartmouth each year,” she said. The 10 veterans admitted through this program do not affect the College’s admissions policy toward other veteran candidates. Huang said Dartmouth also reaches out to veterans through efforts at Tuck and at Geisel’s Masters in Public Health program. 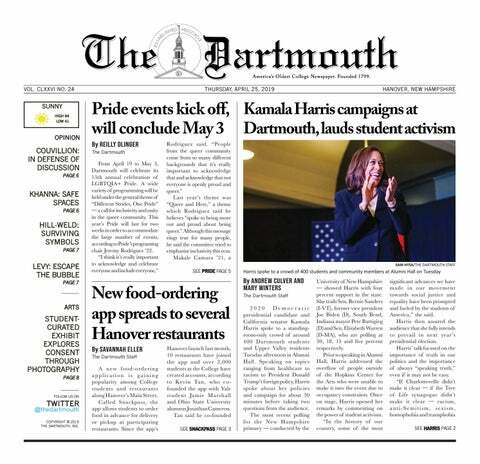 “I am very impressed with and proud of Dartmouth to know that we are getting such strong support for our veterans,” she said. This year, the U.S. News & World Report ranked Dartmouth fifth in its “Best Colleges for Veterans” ranking.